Druing birthday and big holidays like Christmas and Halloween, taking photos retain the happiest moment forever. For the purpose of memorizing all wonderful moments from different photos into one continuous enjoyment, you turn to photo slideshow makers. Photo slideshows provide an opportunity to put pictures you took in big days or travels into a definite order, enriched with various transitions, decorated with suitable effects, in accordance with a certain style. Many people may search for the best slideshow maker on Google to make a slideshow with music they like. Some veteran could find the right photo slideshow maker software as their own best slideshow maker, while some others may be puzzled by so many options online. In this tutorial, we would like to introduce 5 best photo slideshow makers to help you create photo slideshows with music, and photos you take in holidays and big events. Also, we would like to show you the best program to make a slideshow with music and its how-to in detail. 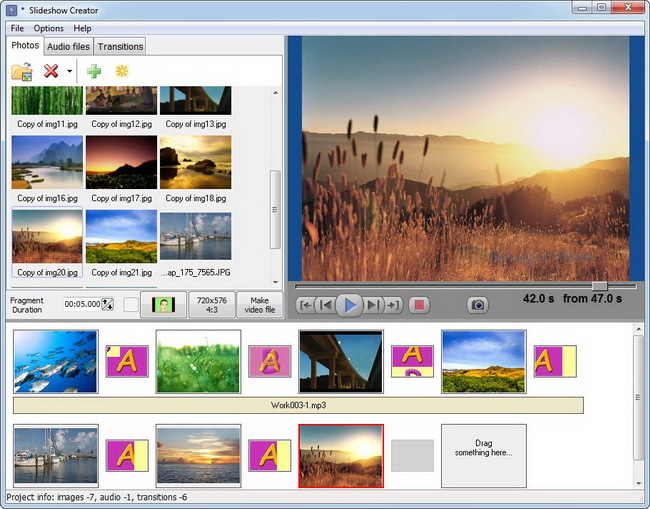 Leawo’s Video Converter Ultimate includes a professional photo slideshow maker and photo slideshow burner. The internal photo slideshow burner allows you to make a photo slideshow with music and personal background. It generates slideshow from photos in one click upon loading, enables you to edit slideshow like: add/remove/reorder photos, set photo duration, transition duration and transition effect, add favorite song as background music, as well as image and video, and set background music effect. This best photo slideshow maker outputs generated photo slideshow to video in 180+ formats and DVD-9/DVD-5 content as you like. 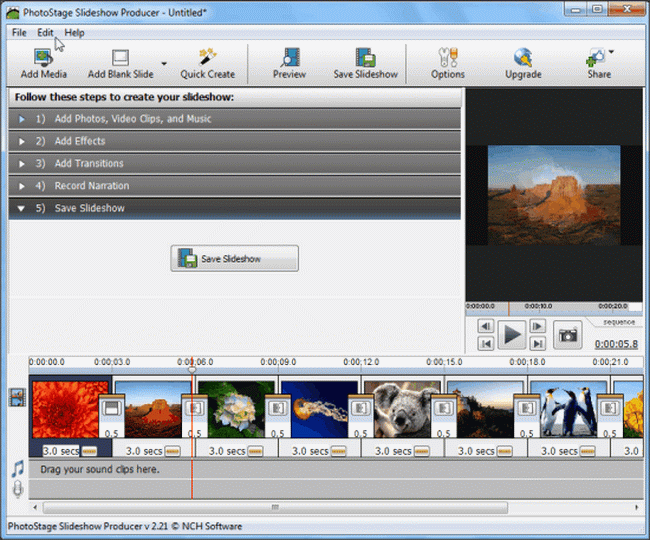 All the necessary components of Slideshow makers are present – transitions, fragment duration, an opportunity to select audio file from your computer as a background. At the end of the work you are proposed to save your creation in three formats – AVI, VMW, MKV and three variants of quality are offered as well. 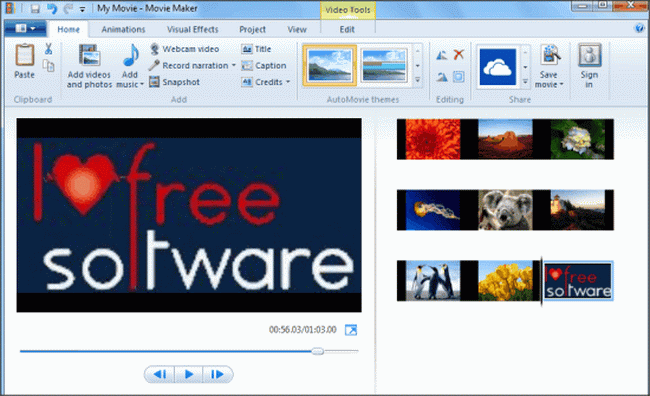 Movie Maker is a product of Microsoft, and most of us are aware about this software as it comes in-built with many versions of Windows. This software is full of features to create really stunning slideshows from a collection of photos. What makes it even more useful is that you can also add a webcam recorded video, and audio narrations in the slideshow. PhotoStage Slideshow Producer is another amazing free software to make slideshows. It has got even more features than Movie Maker. You can add audio narration along with photos, and videos in the slideshow. What makes it more amazing is that you can control the transitions effects with timeline in this freeware. You can save the slideshow as video (in various formats, like: AVI, 3GP, MP4, etc.) and image sequence. You can even write the slideshows on CD/DVD, and upload videos on Facebook, and YouTube. A simple slideshow maker for speedy work (that may be regarded as a drawback, though). The final video will go non-stop until you stop it yourself. A pretty simple interface allows you not to bother your head with various transitions and chose-and-apply buttons – you just select one effect, and the smart program will employ it everywhere. As one of the best photo slideshow maker software, Leawo’s Video Converter Ultimateoffers you the best solution to make a photo slideshow and burn photos to DVD/Blu-ray photo slideshow as you like. It’s the best slideshow maker with music enabled feature to let you freely add your favorite song as background music. ☉ Convert video, Blu-ray and DVD with ease. ☉ Convert video to DVD and burn HD video to Blu-ray. ☉ Create Photo Slideshows and burn photos to Blu-ray/DVD. ☉ Accelerate online video playback loading and downloading. ☉ Create 3D movies from 2D media sources. How to Make a Slideshow with Music under the Help of Leawo Video Converter Ultimate? Source photos (all photos saved in png, jpg, jpeg, bmp formats). Enough hard drive space to save created photo slideshow. If you want to make a slideshow with music, get music file(s) ready as background. 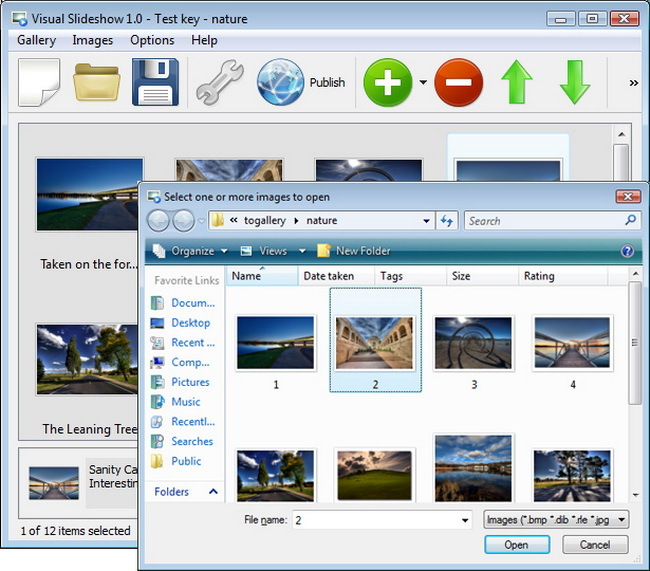 Open the "Convert" module and then click the "Add Photo" button to browse and load your photos into this photo slideshow maker software. Photos would automatically be generated into slideshow upon loading. You could then preview generated photo slideshow via the internal slideshow player. To make a slideshow with music in this photo slideshow maker software, you need to enter the photo slideshow editing panel. Click the the "Edit" icon on the generated slidehow title, or right click the generated slideshow title and then click "Edit" option to enter the "Slideshow Editor" interface. Under Video tab: you could import extra photos, adjust photo position via drag-and-drop, remove photos, set photo duration and transition duration, determine transition effect, etc. Under the Audio tab: you could add background music, and set output audio effect (Fade in, Fade out, or Loop play), etc. This is vital for you to make a slideshow with music. After adding music to slideshow, return to the main interface and then hit the clickable icon right before the big green "Convert" button and then select "Change" option to enter the Profile panel. Select desired profile as output format from "Format" or "Device" group according to your real needs. Note: If you need, click "Edit" button on the drop-down box before the big green "Convert" button to enter the Profile Settings panel for video and audio parameters adjusting, including: video codec, bit rate, resolution, aspect ratio, frame rate, audio codec, video size, etc. Click the green "Convert" button. On the popup sidebar, click the "Save to" box to set an output directory. And then click the "Convert" button. Leawo Video Converter Ultimate would start to make a slideshow with music immediately. The internal Photo Slideshow Editor could only edit slideshows you just generated from your local photo folder. If you want to edit photo slideshows you’ve already created before adding, you could load your slideshow by clicking "Add Video" option and then use the internal slideshow video editor. The Mac version of Leawo Video Converter Ultimate shares the same operation guide as the above Windows version.